GET A GRIP – driving in winter weather. We’re into February already, yet once again are at the mercy of wintry weather conditions. I’m sure many experienced drivers are already dismissive of the risks, and scoffing at the prospect of travelling in adverse weather conditions such as heavy rain, snow or ice. For many however, the heightened risk of an accident, the potential disaster of writing off their vehicle, or the prospect of becoming stranded are cause for a mini panic attack. Understanding how the conditions of the road surface affect stopping distance, cornering, traction and acceleration is fundamental to increasing your driving confidence. The general consensus for hesitant drivers is that moving slower and braking earlier is the best way to avoid an accident. Although this is true, driving too slowly and cautiously in snowy conditions can cause your vehicle to lose traction and end up stranded. Accelerating on ice or in deep snow can be near impossible without winter tyres, snow socks or chains. As you can tell, there are many nuances to safe driving in adverse wintry weather. We’ll look at these further into the article. 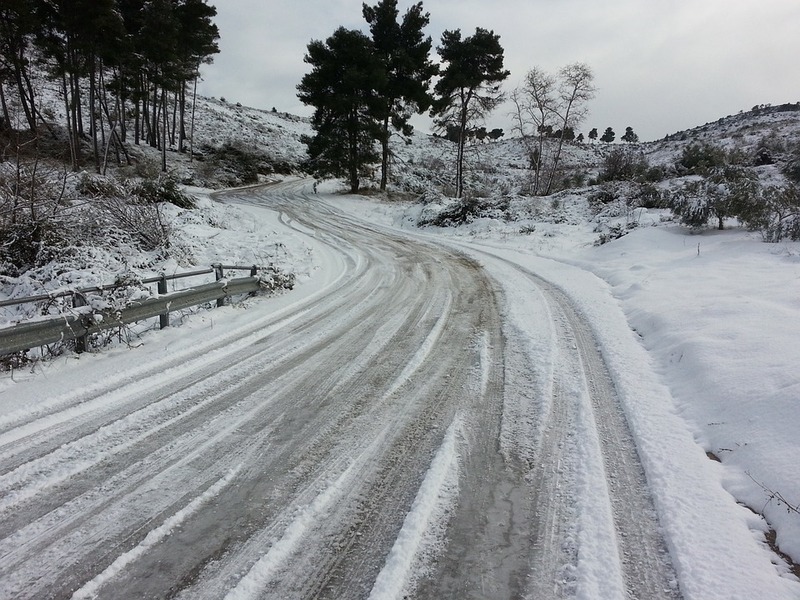 Understeer and oversteer are the main culprits for causing sliding in icy conditions. If you begin to lose control of your vehicle, it is often an indication that you are travelling too fast for the road conditions. If your vehicle begins to slide, do not use your brakes; this will make the slide even worse. To correct the slide, turn your steering wheel in the same direction that the rear of the vehicle is sliding. Be careful to not over-correct as this can result in the vehicle spinning out in the opposite direction. In the video below, Jason Fenske of Engineering Explained breaks down the different caveats to consider when you are travelling in various conditions including rain, snow or on ice. These include understanding how the road surface will influence your traction circle, stopping distances, and cornering radius. Driving in wintery weather conditions is a different animal entirely from driving on dry and clear roads. Even with the best of intentions and a thorough understanding of how traction, stopping distances and cornering are affected, knowledge is not always enough. Winter tyres are pretty self explanatory. The standard legal minimum tread depth on a tyre is 1.6mm, however in adverse weather conditions these can be inadequate for gaining sufficient traction with the road surface. Winter tyres typically have a tread depth of around 4mm minimum, with some as high as 9mm. The benefits of the increased tread depth, coupled with the different compound that prevents the tyre from hardening in the cold include reduced stopping distances and increased control in snow or ice. Winter tyres can be used all year round, however due to the increased wear they receive in comparison to standard tyres, this is not advisable. A snow sock is an elasticated cover that fits over your standard tyres for additional traction and grip. On the flat snow socks perform really well, however on banks their effects are significantly reduced. Typically made from Kevlar which has a coarse surface designed to provide greater grip, a set of snow socks can greatly improve your control whilst driving in snow or ice. A huge benefit of snow socks is their ease of fitting, which can be done single handedly, and relatively quickly. Simply place the snow sock around the tyre as much as possible, reverse slightly to expose the part of the tyre without cover, and finish fitting the sock. A snow sock can be bought for around £30-£60. Snow chains are exactly what the name suggests; heavy duty chains that are fastened around the wheels of the vehicle. Snow chains come in ladder or diamond patterns that prevent the tyres from spinning uncontrollably, and combat lateral sliding. Typically snow chains that can be purchased from stores or online are a combination of both ladder and diamond patterns. Chains can be tricky to fit, and can damage the bodywork and moving parts of the wheel such as suspension or brakes. You are not permitted to use chains on your tyres where the road is gritted or clear as doing so can severely damage the road surface. Traction mats (also known as “recovery boards”) are quite simply strips or boards of materials such fibreglass, rubber and steel that can be inserted under the tyres to help a vehicle gain traction when it becomes stuck. The advantage to traction mats is their ease of use; they are often relatively light and can be easily stored in the boot. When required, simply retrieve them, tuck them under the tyres and away you go. Traction mats can be used for a range of terrain where your vehicle may become stuck including snow, sand and mud. With the correct knowledge, you can prepare yourself for the inevitable wintry weather and increase your confidence with driving in adverse conditions. Regardless of your confidence, it is always advisable to not undertake any non-essential journey when the road conditions are treacherous. If you must travel by vehicle in adverse weather conditions, always ensure you are adequately equipped for all possible scenarios. If you are unable to fit winter tyres, consider carrying snow socks/chains/traction mats. It is also sensible to carry blankets, snacks and drinks on the off chance you become stranded. Remember, just because you are prepared does not mean every other driver will be. If you have found the information in this article helpful, please consider sharing us with your friends and family, and also follow us on social media for more content like this..
⟵Could Pothole Payout be the Answer to our Problem?